This example shows how to use the Robust Control Toolbox™ commands usample, ucover and dksyn to design a robust controller with standard performance objectives. It can serve as a template for more complex robust control design tasks. A collection of step responses for randomly sampled uncertainty values illustrates the plant variability. The uncertain plant model P contains 3 uncertain elements. For feedback design purposes, it is often desirable to simplify the uncertainty model while approximately retaining its overall variability. This is one use of the command ucover. This command takes an array of LTI responses Pa and a nominal response Pn and models the difference Pa-Pn as multiplicative uncertainty in the system dynamics (ultidyn). where all the uncertainty is concentrated in the "unmodeled dynamics" component Delta (a ultidyn object). Choose the nominal value of P as center Pn of the cover, and use a 2nd-order shaping filter Wt to capture how the relative gap between Parray and Pn varies with frequency. Verify that the filter magnitude (in red) "covers" the relative variations of the plant frequency response (in blue). 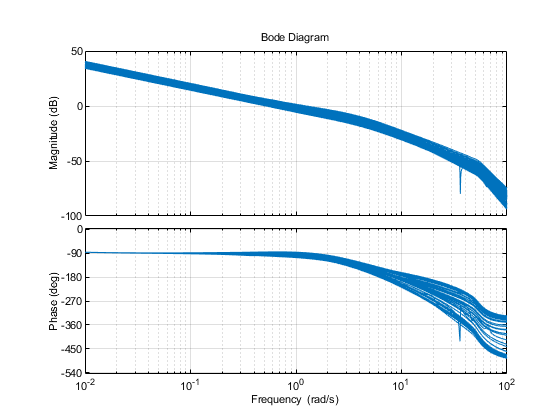 To design a robust controller for the uncertain plant P, choose a target closed-loop bandwidth desBW and perform a sensitivity-minimization design using the simplified uncertainty model Usys. The control structure is shown in Figure 1. The main signals are the disturbance d, the measurement noise n, the control signal u, and the plant output y. 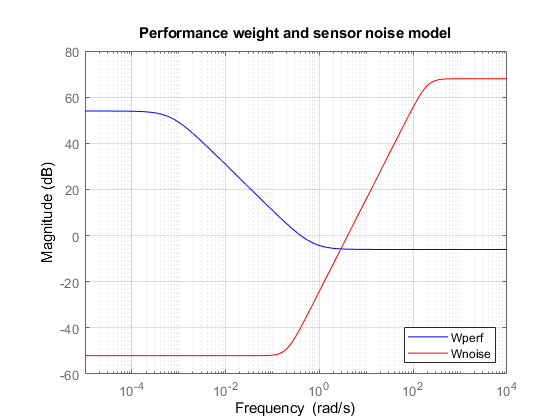 The filters Wperf and Wnoise reflect the frequency content of the disturbance and noise signals, or equivalently, the frequency bands where good disturbance and noise rejection properties are needed. so the transfer function of interest consists of performance- and noise-weighted versions of the sensitivity function 1/(1+PC) and complementary sensitivity function PC/(1+PC). The controller design is carried out with the automated robust design command dksyn. The uncertain open-loop model is given by M.
The muBound is a positive scalar. If it is near 1, then the design is successful and the desired and effective closed-loop bandwidths match closely. As a rule of thumb, if muBound is less than 0.85, then the achievable performance can be improved. When muBound is greater than 1.2, then the desired closed-loop bandwidth is not achievable for the given amount of plant uncertainty. 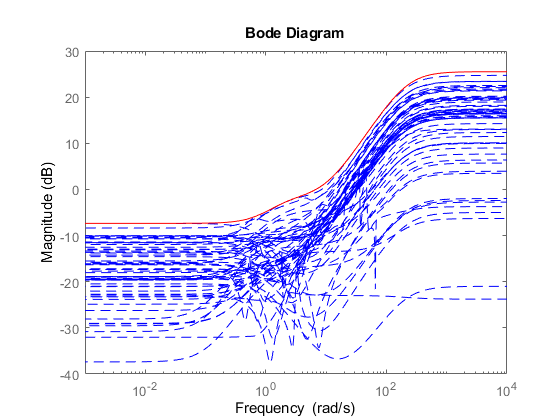 Randomized closed-loop Bode plots confirm a closed-loop disturbance rejection bandwidth of approximately 0.4 rad/s. 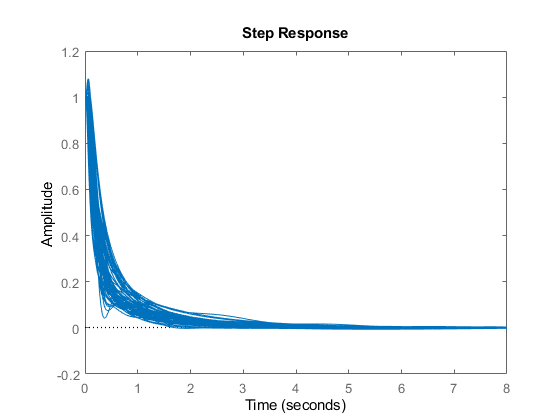 Finally, compute and plot the closed-loop responses to a step disturbance at the plant output. These are consistent with the desired closed-loop bandwidth of 0.4, with settling times approximately 7 seconds. In this naive design strategy, we have correlated the noise bandwidth with the desired closed-loop bandwidth. This simply helps limit the controller bandwidth. A fair perspective is that this approach focuses on output disturbance attenuation in the face of plant model uncertainty. Sensor noise is not truly addressed. Problems with considerable amounts of sensor noise would be dealt with in a different manner. Let's redo the design for a higher target bandwidth and adjusting the noise bandwidth as well. With muBound2 about 0.99, this design achieves a good tradeoff between performance goals and plant uncertainty. 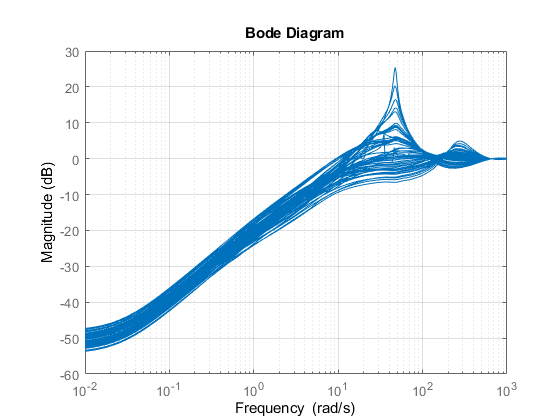 Open-loop Bode plots confirm a fairly robust design with decent phase margins, but not as good as the lower bandwidth design. 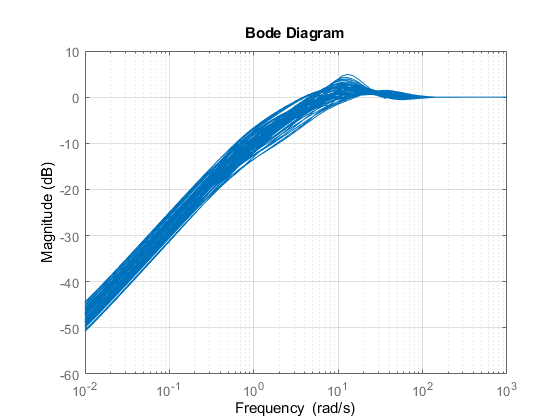 Randomized closed-loop Bode plots confirm a closed-loop bandwidth of approximately 2 rad/s. 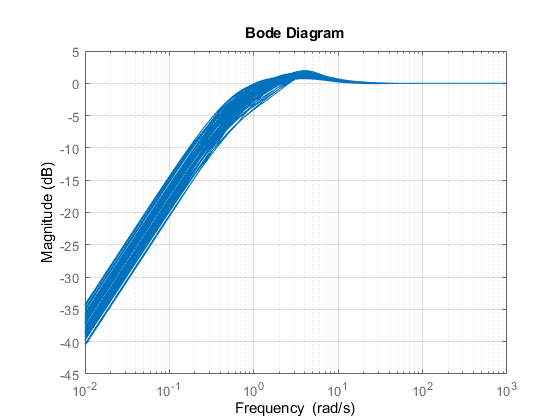 The frequency response has a bit more peaking than was seen in the lower bandwidth design, due to the increased uncertainty in the model at this frequency. Since the Robust Performance mu-value was 0.99, we expected some degradation in the robustness of the performance objectives over the lower bandwidth design. 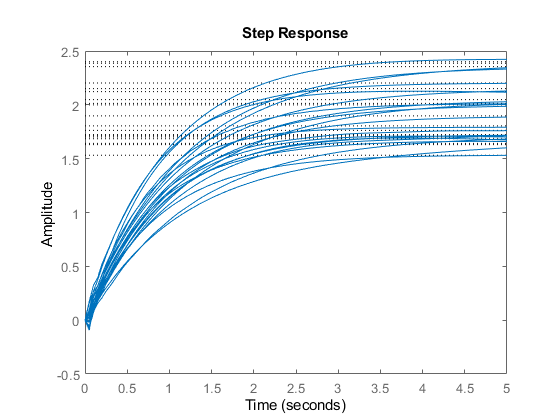 Closed-loop step disturbance responses further illustrate the higher bandwidth response, with reasonable robustness across the plant model variability. Redo the design once more with an extremely optimistic closed-loop bandwidth goal of 15 rad/s. Since muBound3 is greater than 1.5, the closed-loop performance goals are not achieved under plant uncertainties. The frequency responses of the closed-loop system have higher peaks indicating the poor performance of the designed controller. 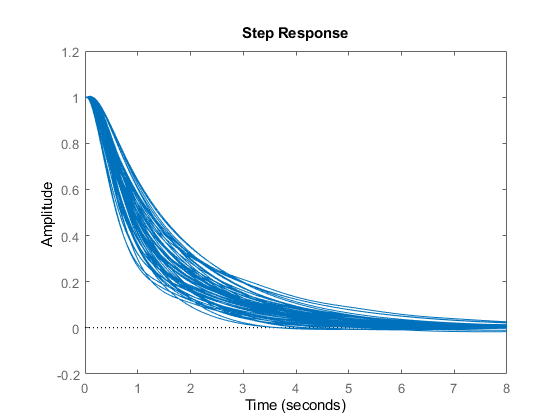 Similarly, step responses under uncertainties illustrate the poor closed-loop performance. 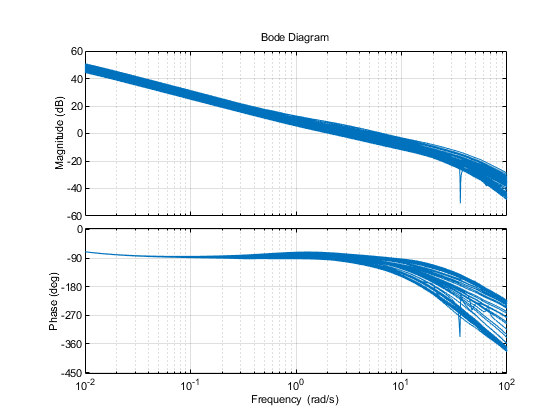 The Bode and Step response plots shown above are generated from samples of the uncertain plant model P. We can use the uncertain model directly, and assess the robust stability of the 3 closed-loop systems. -- It can tolerate up to 333% of the modeled uncertainty. -- There is a destabilizing perturbation amounting to 333% of the modeled uncertainty. -- This perturbation causes an instability at the frequency Inf rad/seconds. -- It can tolerate up to 154% of the modeled uncertainty. -- There is a destabilizing perturbation amounting to 155% of the modeled uncertainty. -- This perturbation causes an instability at the frequency 15.9 rad/seconds. System is not robustly stable for the modeled uncertainty. -- It can tolerate up to 82.5% of the modeled uncertainty. -- There is a destabilizing perturbation amounting to 82.7% of the modeled uncertainty. -- This perturbation causes an instability at the frequency 75.2 rad/seconds. 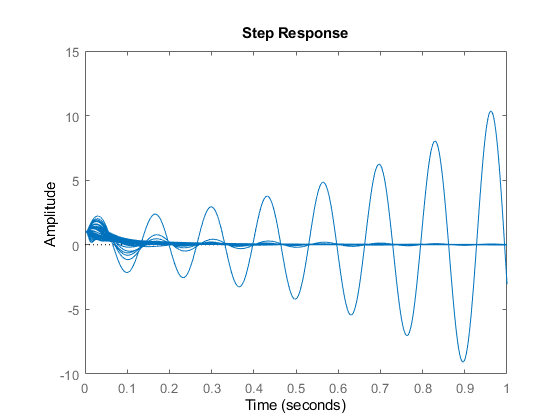 The robustness analysis reports confirm what we have observed by sampling the closed-loop time and frequency responses. The second design is a good compromise between performance and robustness, and the third design is too aggressive and lacks robustness.